This cake was a challenge. 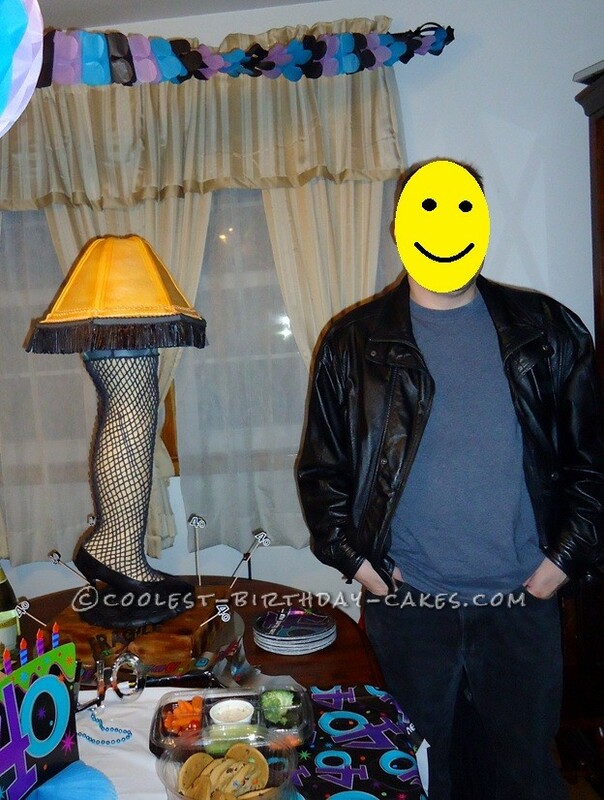 A friend of mine has a husband who loves a Christmas Story and has a miniature version of the Leg Lamp from the movie. She wanted to do something special since it was his 40th birthday. I am self taught and this was going to be a challenge, as I have never worked with rice crispy treats before. For the leg, I did use a real new shoe that I cut up so I just had the sole to use. I used the rice crispy treat recipe – 4 c. mini marshmallows and 6 c. rice crispies, then molded the leg with it. I then covered it with royal icing and flesh colored fondant and piped on the fishnet stocking with black royal icing. The crate was a 2 layer cake wrapped in fondant that was marbleized and the torch to give it a more realistic look. The lamp shade was a 5 layer cake sculpted to the lamp shade shape. Spray with edible colors to make it more realistic. The fringe is strips of gum paste I cut. I even added LED lights to it so it lit up like a real lamp.